Who wants to dissipate a crowd? Shorten the line to get into Comic-Con? Gain some alone time with the Mona Lisa at the Louvre? Convince the cop you really were going 120 in response to massive GI issues? 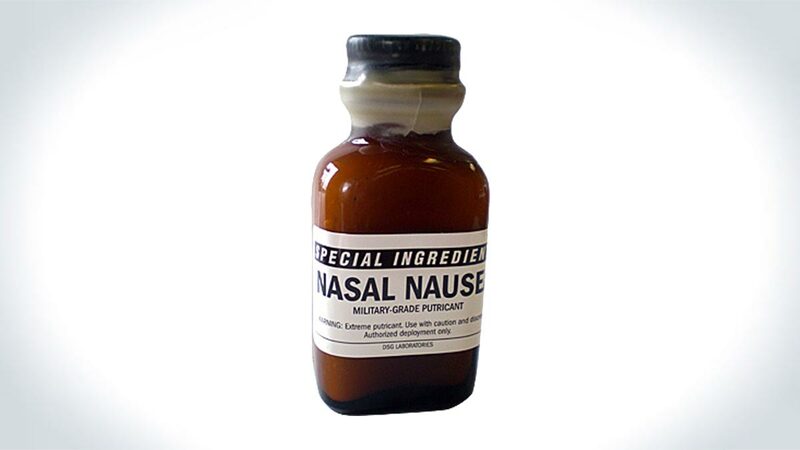 Nasal Nausea, a military-grade stink solution, is your ticket to clearing a room. To pulling the ultimate odor-driven prank. And possibly to losing a friend or two. Hopefully just the ones who were dead weight anyway. Vendor DSG Labs describes Nasal Nausea's scent as "harrowing," "assaultive," and "so foul and disgusting that it can overwhelm anyone in its vicinity." Its military-grade classification is legit too--a stink bomb solution officially saluted by the US Armed Forces. "I can sincerely vouch that Nasal Nausea is the most horrendous thing that I've ever come into contact with." "The stench from this stuff would cover the smell of a portable toilet sitting on a pile of roadkill at a 4th of July chili cook off! Do not, and I stress DO NOT OPEN THIS STUFF INSIDE YOUR HOME!!! I had purchased this stuff for a little 'heater vent revenge' but I can honestly say, I think it might be a little too potent for that." "It smells like skunk. Pure gnarly skunk smell. It's powerful and lingers for hours. You must be willing to endure the smell yourself if you wish to hang around to see its effects on people." "I have always been fond of the stink bomb due to the amount of victims you can have (and laugh at) for a small price. With [Nasal Nausea] though, its more like an epidemic." "Still torturing my kids with it." Military-grade smell effects for Halloween, anyone?